Our ancestors lived and died in a little village called Inkpen; which is about 12 miles from Newbury, Berkshire, England. It is a beautiful area with green rolling hills, open meadows and wooded hilltops. Green hedges separate the grounds instead of fences. There are some sheep in the fields contentedly grazing on the green grass. One has to turn off the main highway and drive on a narrow road about three or four miles before coming to a canal. In decades past families traveled on these canals making their living taking cargo up and down. There are still boats in the canals although the freight is transported by mechanized boats now and the highway system. After crossing the canal, it is like stepping into another world. 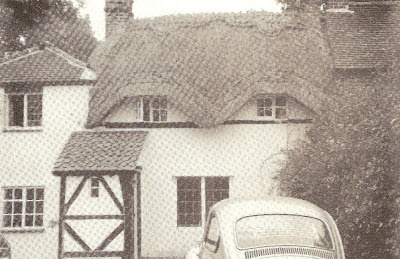 There are thatched roofed cottages, some built in the early 1700s. There are tall green hedges and beautiful flowers and shrubbery. The parish church, which sits on a hill, was built in the 13th century. The stone step is worn and indented where people have stepped down into the church for hundreds of years. It is very old but well kept and very interesting inside because of the stone work and the dark wood paneling and pews. There are no fancy furnishings, no padded benches, however the architecture in the building is wonderful and the room is decorated with fresh flowers. The building and grounds around it are lovingly kept and tended. This is the church that Mary Jane White Black walked the three miles to and from every Sunday to worship until she was in her 80s. She was a faithful, religious woman who lived during a time of sickness and hardship. Here, in the parish graveyard she and other members of her family are buried. Amos Blackney (who married Mary Jane White) was born about 1804, and christened 23 February 1806 in Boxford, Berkshire, England to Clementina Ayres and William Blackman. Clementina, it seems, came from gypsy blood. 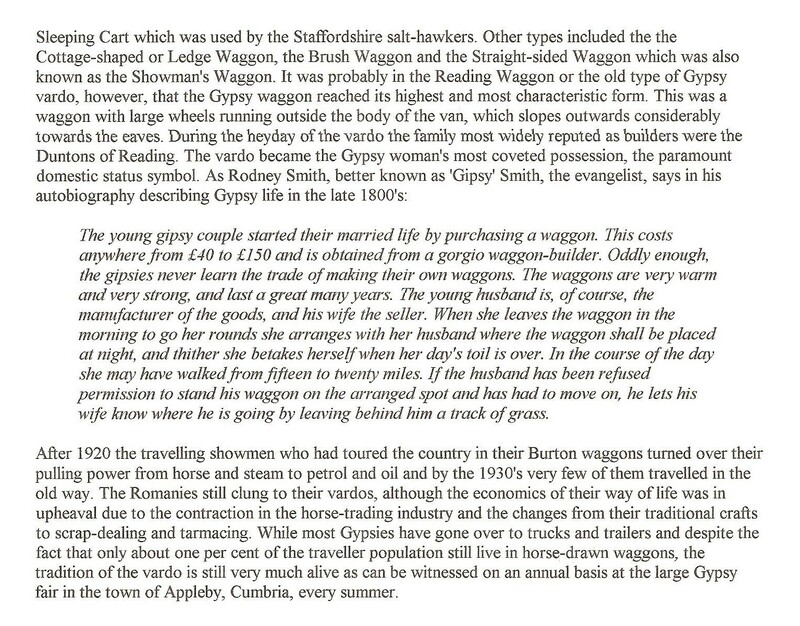 Below are some interesting insights about the Gypsy. Gypsies are fundamentally the same the world over either in their ancient language, their gestures, or in their physical resemblance. The reason for inserting these excerpts was to give a little background into the life of our ancestors as we have found that they did indeed travel through these areas at specific times of the year for livestock shows and meeting places of their peers. Amos had an older brother, Thomas, born 21 October 1802; and a younger step-sister, Arabella, born 11 May 1810. We don’t know very much about Amos, only that he was a hawker by trade. He loved horses and passed this love on to his children. By the time he was in his early 60s he had become an invalid and was bedridden for the next 12 years. For a man who had spent his entire life traveling the countryside and being outdoors, this must have been very hard on him. Amos passed away 18 March 1875 and was buried in the parish churchyard in Inkpen. 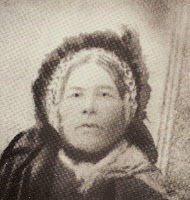 Our Mary Jane White was born in 1810, christened 8 January 1814 in Beaulieu, Southampton, a busy port city, to Thomas and Mary White, travellors. It was common for travellors to have their children blessed when they were several years old. Couples were married first in the Gypsy ceremony and then later in a church ceremony when pressed by the government. The Napoleonic Wars were going on at this time (1799-1814) and could also have had a factor in the location of the family. We have not had any success in finding any other information about Jane or her parents so far. When she was about 20, she met and married Amos Black. They traveled around the country trading horses and doing business. We have found that families traveled together and married within the group. So Jane’s and Amos’ families probably knew each other and traveled together. 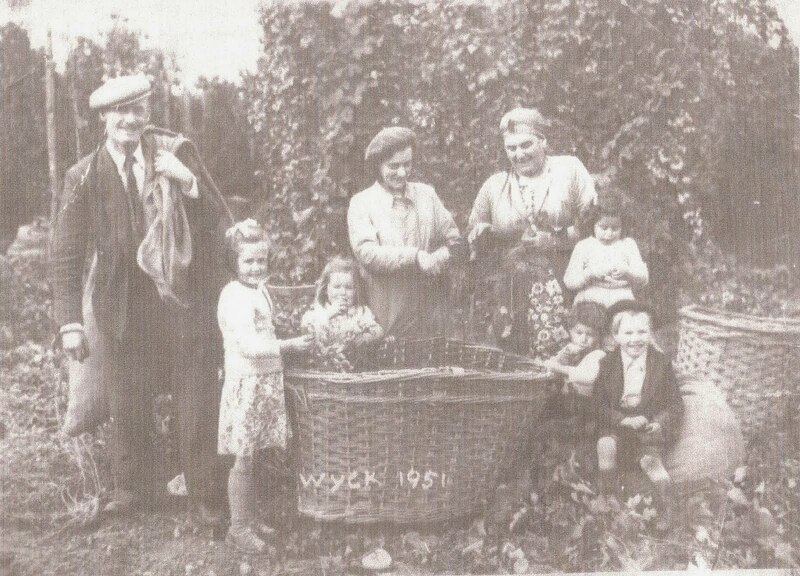 Parish records say they were “Gypsies”. Their children were born in scattered places and have been very difficult to trace but seem to be in a circular pattern geographically. Mary Jane and Amos had 14 children within a span of 28 years. The Blacks owned 2 or 3 cottages in Inkpen and so were hard working people. The oldest son, Amos, became quite influential in the community. Jane also became a woman beloved by many in her community. She lived to see the dawning of a new century — one of promise and fulfillment. She died 14 November 1900. Amos and Jane share the same headstone in the churchyard. Amos’ death date inscription is readable but the growth on the headstone makes the other inscription under his illegible. 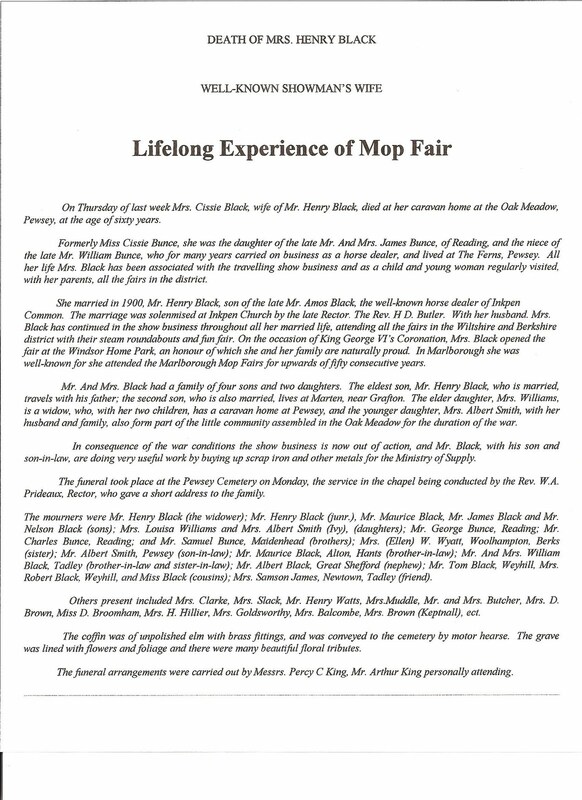 On the following page is an obituary of Mary Jane (White) Black, which was written in an English newspaper and taken from a copy in possession of Fenton Matkin, Swan Lake, Idaho, originally coming from his mother, Julia Constance Allen Matkin. On Wednesday, in last week, was laid to rest, near the entrance of the old churchyard, one of the best known local characters in the county of Berkshire. Popularly known as “Granny Black”, Mary Jane Black has, for considerably more than an ordinary lifetime, travelled the neighborhood far and wide with her basket of small wares slung across her shoulder, and her picturesque figure and insinuating style of introducing the articles she had for sale, will long be remembered by those who knew her. Curiously enough her maiden name was White, so that by the marriage ceremony White was transformed into Black. She was born at Southampton, and at an early age married Amos Black, from which union has sprung the considerable community of Blacks now living on Inkpen Common. 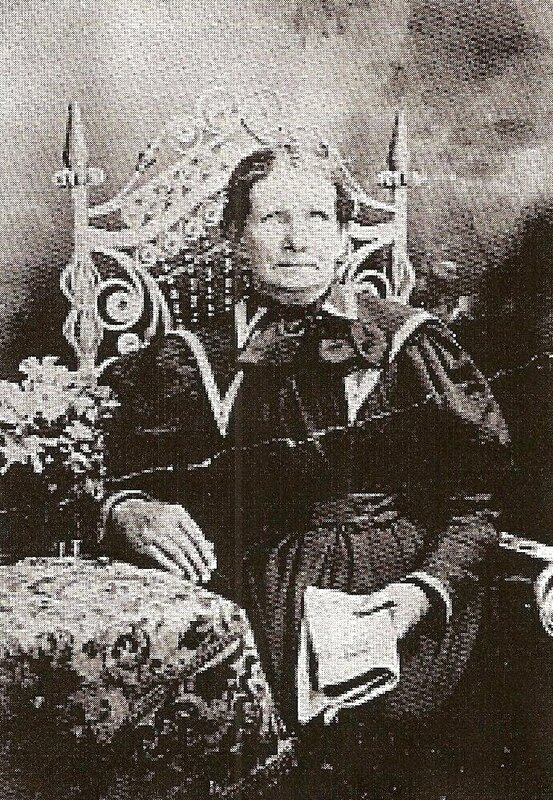 After becoming the mother of 14 children, ten of whom are now living, she was left a widow in 1875, her husband dying of paralysis at the age of 74. He had then been an invalid for twelve years, and during that time his brave wife struggled on and succeeded in supporting him and the three children then dependent on her. Since then, up to quite recently, she has followed her old occupation, and it speaks well for the benefits to health of an outdoor life that the old lady attained the age of 90 before she died. Many a romantic yarn did Granny indulge in, telling to susceptible housemaids who loved to have their ears tickled with the promises of a charming married life for their future, and who in return were induced to buy from the old woman’s stores. While on her rounds Granny might often have been seen puffing away at her short clay “piple”, for the old lady loved her ‘bit of baccy’ and was as voluble as Kingsley in sounding the praises of what to her was a ‘lone woman’s companion’. She leaves a little army of 200 grandchildren to the third generation to mourn their loss, some of whom have found a home across the Atlantic. A good number of her descendants followed her to the grave, but her eldest son much regrets that he was unable to attend, on account of being laid up with a serious attack of dropsy. During the latter part of Granny’s life she has lived with her youngest son, Maurice, who with his wife, Annie, has solaced by tender care the old lady’s declining days. It is worthy of notice that long after she had reached the age of 80 “Granny” has frequently walked to church and back on a Sunday morning, a distance of almost three miles. This is a model of a van similar to the one that Rosanna and her family traveled in during the summer. 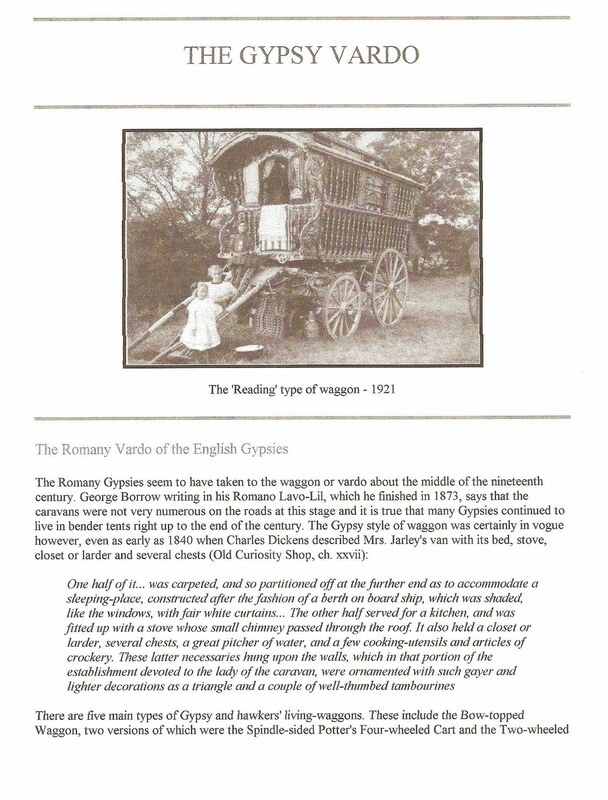 Brother Joseph Eastwood of Leicester, England, a mission field friend of my husband, Kent, and who is also a Gypsy, sent this to us and said that he was born in one like this and that it is called a “Bow Top Caravan” or “Vardo”. 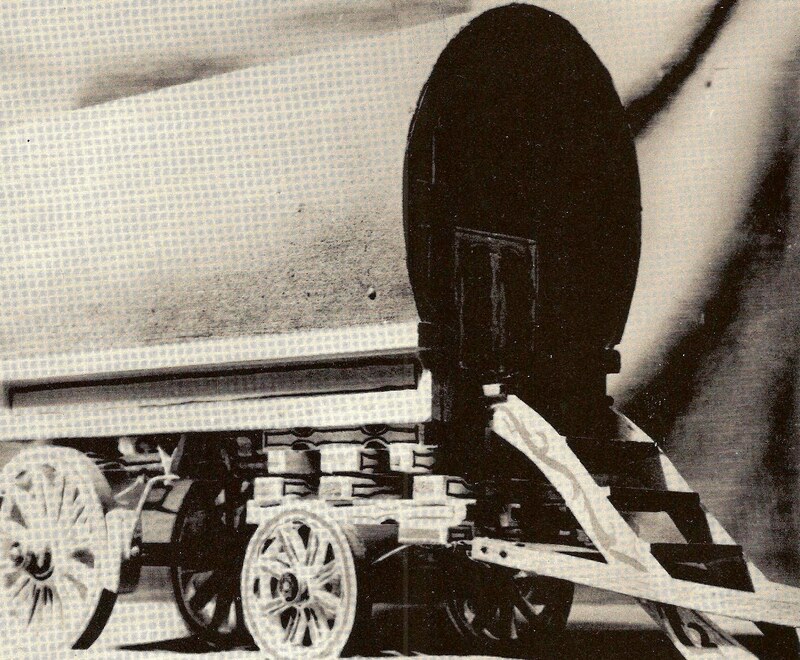 His particular family vardo was built in Walsall, in Staffs, England about 1920 and was used regularly in and all about England until 1973; however, they were used before for generations. These carefully, lovingly, and ornately decorated vardos often changed hands along with horses at the Fairs. Many vardos have exquisitely worked gold-gilding and etched glass. They are painted in bright colors on the outside and decorated in bright colors on the inside. “Black Latches”, Inkpen Common, England 1978. House faces the Common where caravans were camped. Originally three houses in one, the date on the chimney is 1836. Below showing the right side view of the house. The front part on right was once a store. The Blacks owned all three houses at one time. Maurice Black, Rosanna’s younger brother, loved to spend time in his garden. In this picture you can see the beautiful flowers and trees and well kept yard that he kept. Rose Cottage is in the background and notice the attached brick house on the side. This kind of construction was not uncommon there, and the home next door could have also been owned by another member of the family. Grandmother Jane lived here with Maurice and his wife, Annie, in her old age. These homes are about three miles from the Parish Church where they attended church. These pictures were made possible through Peggy Salter, a great-granddaughter of Maurice, who lives in England and has been in contact with us over the years. The Parish Church in Inkpen. The headstone in front above is of Alice Black, 19 year old daughter of Amos Black, Jr. Amos Sr. and Mary Jane’s headstone is immediately behind this one. The writing is worn and almost unreadable. We entered the church from the doorway on the side. There were other graves in the back of the churchyard to the right of the picture. 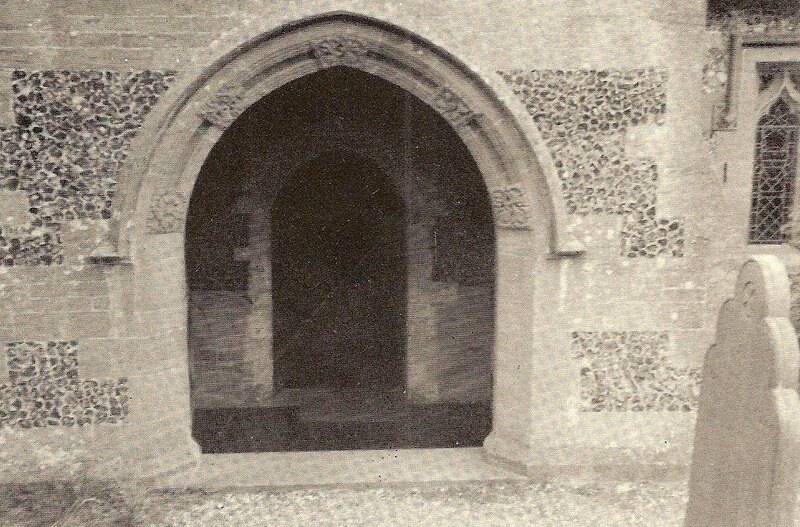 Below is the entrance to the church. One has to step down a few time worn steps to get inside to the chapel which was beautifully cared for with wood benches and pews. 1806 - Amos Black/ney/man was christened the 23 February 1806 in Boxford, Berkshire, England. The parents listed were William Blackman and Clemontina Ayres. Amos grew up without a father in the home. His mother had to make a living for the family. 1814 - Mary Jane White was christened the 8 January 1814 in Beaulieu, Hampshire, England. Her parents were Thomas White and Mary, his wife, and they are listed as ‘Travellors’. 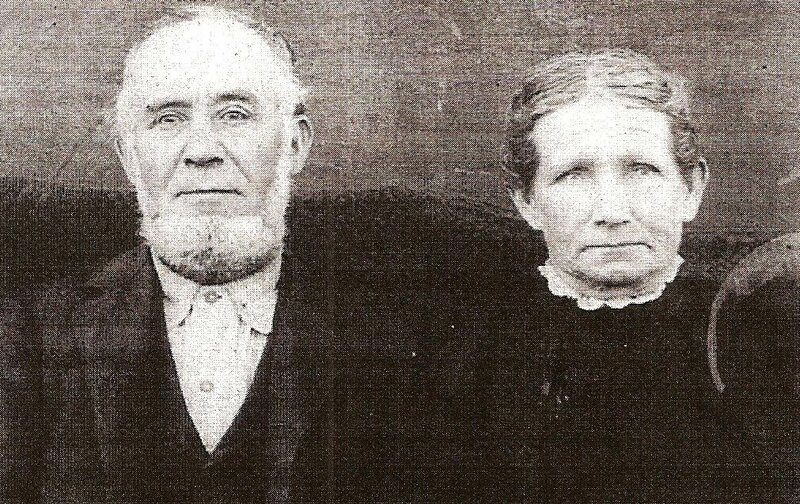 1831 - Amos and Mary have been living together as husband and wife under Gypsy law. Their first child, Lemontania Black is christened 21 November in Boxford, Berkshire. 1833 - Mary Ann Black is christened the 4 August at Combe, Hampshire. 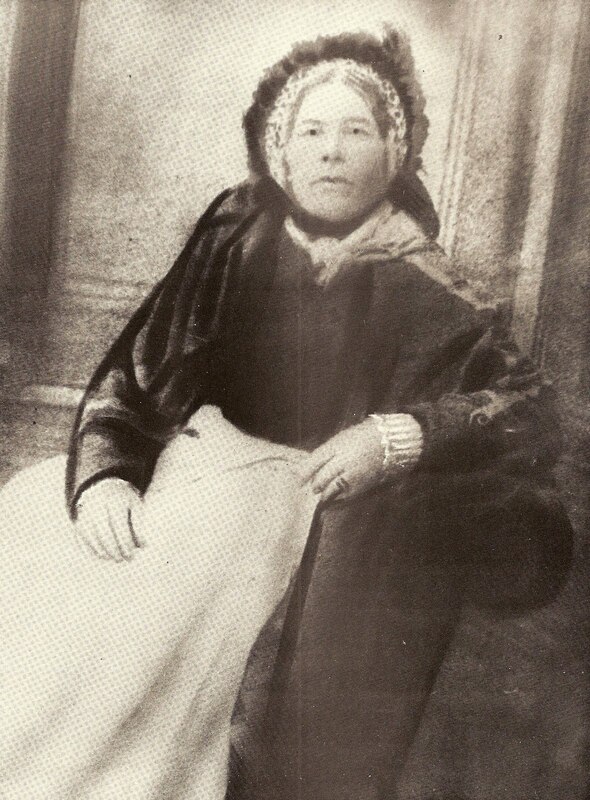 1835 - Jemima Black(man) is christened the 20 July 1835 at Hurstbourne Tarrant, Hampshire. 1838 - Alice Black is christened the 29 March 1838 at Hurstbourne Tarrant, Hampshire. 1839 - Amos Black (junior) is born sometime during this year, we haven’t found the date for sure. 1840 - On the 18 May 1840 Amos Black and Jane White are married by English law at Linkenholt, Hampshire. 1842 - Walter Willis Black is born the 21 June 1842 at Kintbury, Berkshire. 1844 - Henry Black is born the 24 April 1844 at Kintbury and christened at Hungerford, Berkshire. 1846 - John Black is born the 29 March 1846 at Speen, Berkshire. 1848 - Rosanna Black is born the 19 January 1848 at Inkpen, Berkshire. 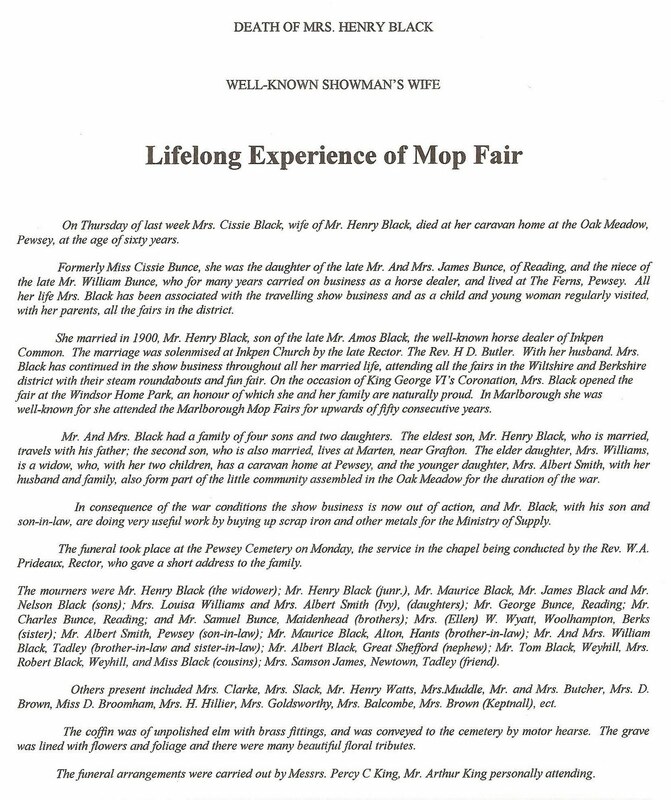 1849 - Lemontania Black is married the 23 July 1849 to James Williams in Kintbury, Berkshire. She is 17 years old. 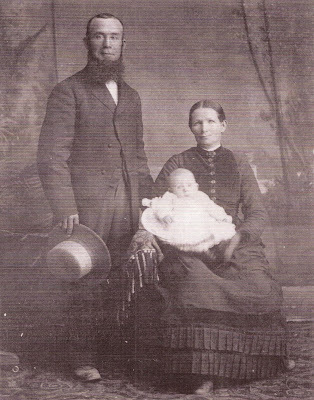 1850 - Thomas Black is born to Amos and Jane the 19 January 1850 on Rosanna’s birthday. They are at Kintbury, Berkshire. 1852 - Matthew Black is born to Amos and Jane the 28 March 1852 at Thatcham, Berkshire. Sometime during this year, Susan Williams is born to Lemontania and James. 1853 - 7 January 1853 James Williams the son of Mary Ann Black and Richard Williams is christened at Winterbourne, Speen, Berkshire. 6 July 1853 Jemima Black marries James Aldridge at Avington, Berkshire. 1854 - is a busy year for grandchildren. Tom Williams the son of Mary Ann Black and Richard Williams is born at Newbury, Berkshire. Jemima Williams the daughter of Lemontania Black and James Williams is born. The 29 June 1854 James Aldridge the son of Jemima Black and James Aldridge is christened at Stratfield Mortimer, Berkshire. 1855 - In the meantime Jane is expecting a child. Arabella (Isabella or Bella) Black is born in Mortimer, Inkpen, Berkshire. 1856 - 7 January 1856 grandchild, Amos Williams the son of Mary Ann Black and Richard Williams is christened at Inkpen, Berkshire. And 2 June 1856 grandchild, Sampson Williams the son of Lemontania Black and James Williams is christened at Newbury, Berkshire. 24 December 1856 Rhoda Black the daughter of Amos and Jane is born at Newbury, Berkshire. 1857 - Is a sad year for the family. Thomas Black the son of Amos and Jane died the 18 of September at Inkpen, Berkshire and is buried there. Sometime during this year, granddaughter, Charlotte Aldridge daughter of Jemima Black and James Aldridge is born at Ogbourne, Wiltshire. 1858 - Just six months after his brother’s death, Matthew Black, son of Amos and Jane dies the 6 March and is buried at Inkpen, Berkshire. Three and one half months later, Jane gives birth to her last child, Maurice Black, on the 27 June 1858 at Inkpen. 1859 - Richard Williams the son of Mary Ann Black and Richard Williams is born at Newbury, Berkshire. 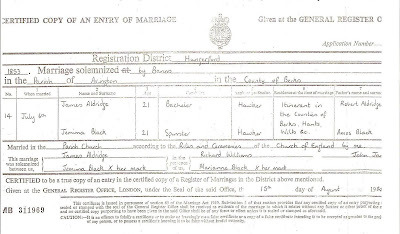 3 November 1859 Mary Ann Black and Richard Williams are married according to English law at Woodlands, Hampshire. 1859/1860 - Ann Maria Aldridge the daughter of Jemima Black and James Aldridge is born at Newbury, Berkshire. The 30 September 1860 Sarah Williams the daughter of Mary Ann Black and Richard Williams is christened at Farnham, Surrey. 1861 - William Aldridge the son of Jemima Black and James Aldridge is born at Newbury, Berkshire. 3 March 1861 Emma Barney the daughter of Alice Black and Vanlo Barney is christened at Chilworth, Hampshire. 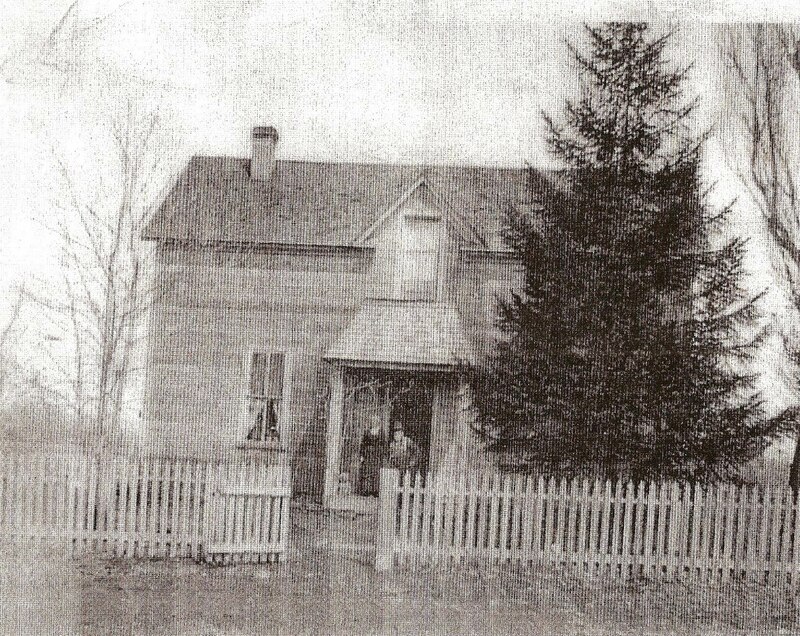 19 April 1861 Alice Black the daughter of Amos Black Jr. and Mary Roberts is born at Old Newton Road in Newbury. 1863 - Thomas Aldridge the son of Jemma Black and James Aldridge is born at Newbury, Berkshire. Between 1863-1864 Brittania Black the granddaughter of Amos and Jane that was living with them in the 1871 census, is born at Winchester, Hampshire. (We haven’t found out who her parents were yet). 1863, Mary Williams the daughter of Mary Ann Black and Richard Williams is born at Newbury, Berkshire. 6 September 1863 Ameline Barney the son of Alice Black and Vanlo Barney is christened at Holybourne, Hampshire. 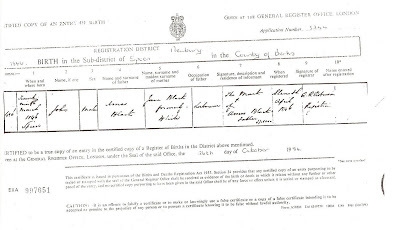 22 November 1863 John George Black the son of Walter Willis Black and Eliza Hughes is christened at Inkpen, Berkshire. 1864 - Robert Aldridge the son of Jemima Black and James Aldridge is born at Newbury, Berkshire. 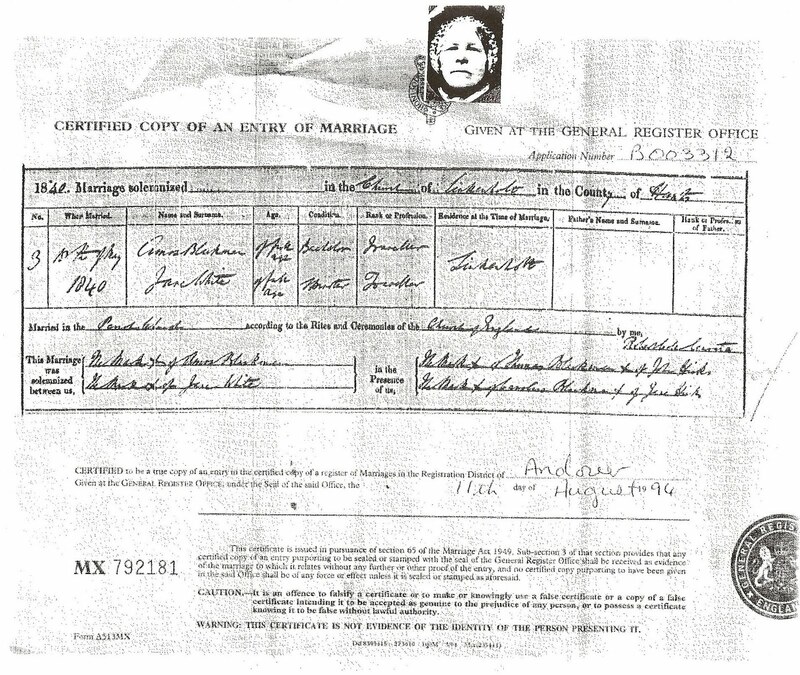 24 July 1865 Rosanna Black and Edwin Spackman are married in Burbage, Wiltshire. Edwin’s family have long been members of the LDS church. This is the first time we have family listed as being in Wiltshire. Rosanna’s parents were not present at the marriage and maybe were not in favor of it. Rosanna showed signs of leaving the gypsy culture. 17 September 1865 Brittania Barney the daughter of Alice Black and Vanlo Barney is christened at Holybourne, Hampshire. 22 October 1865 Charlotte Black the daughter of Henry Black and Rosa Cole is christened at Inkpen, Berkshire. She was born at Bentley. 1866 - 23 September 1866 Charlotte Black the daughter of Walter Black and Eliza is christened at Farnham, Surrey. 27 September 1866 Amos Spackman the son of Rosanna Black and Edwin Spackman is born at Coldrey, Hampshire. 30 September 1866 Amos Black (born 1864) the son of Amos Black Jr. and Mary Roberts is christened at Farnham, Surrey. 30 September 1866 Mary Black (born 1866) the daughter of Amos Black Jr. and Mary Roberts is christened at Farnham, Surrey. 8 November 1866 Caroline Blackman the daughter of John Black and Mary Doe is christened at Newbury, Berkshire. 28 December 1866 Absalom Williams the son of Mary Ann Black and Richard Williams is christened at Hungerfore, Berkshire. 1867 - Edwin Aldridge the son of Jemma Black and James Aldridge is born at Newbury, Berkshire. 23 June 1867 Henry Black the son of Henry Black and Rosa Cole is christened at Inkpen, Berkshire. 22 September 1867 Amos Barney the son of Alice Black and Vanlo Barney is christened at Binstead, Hampshire. 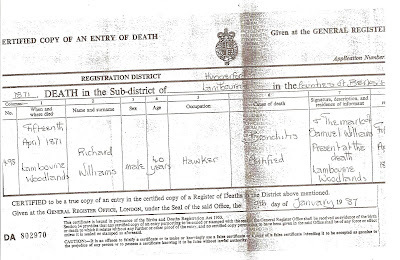 1868 - 10 January 1868 Ralph Williams the son of Lemontania Black and James Williams is christened at Hungerford, Berkshire. 14 January 1868 Susan Williams the daughter of Lemontania Black and James Williams is christened at Hungerford, Berkshire. (Probably the same day rather than 4 days apart). 8 November 1868 Annie Spackman the daughter of Rosanna Black and Edwin Spackman is born at West Woodhay, Berkshire. 1869 - 2 January 1869 Jane Williams the daughter of Mary Ann Black and Richard Williams was christened at Hungerford, Berkshire. 22 April 1869 Nelson Blackman the son of Amos Jr. and Mary Roberts was born at Inkpen. 9 May 1869 Athalia Barney the daughter of Alice Black and Vanlo Barney was christened at Weeks, Hampshire. Sometime during this year Bella Black daughter of John Black and Mary Doe was born at Horsham, Surrey; and Thomas Black the son of Henry Black and Rosa Cole was born at Micheldever, Hampshire. 1870 - Sometime during this year Henry Williams the son of Lemontania Black and James Williams was born at Wash Common, Newbury, Berkshire. 26 August 1870 Charlotte Spackman the daughter of Rosanna Black and Edwin Spackman was born at West Woodhay, Berkshire. 4 September 1870 Job Williams th son of Mary Ann Black and Richard Williams was christened at Farnham, Surrey. 18 September 1870 Jemima Williams the daughter of Lemontania Black and James Williams was christened at Farnham, Surrey. 1871 - By the time the 1871 census was taken, James Aldridge, the husband of Jemima Black was dead. 11 January 1871 Maria Black the daughter of John Black and Mary Ann Doe was born at Inkpen, Berkshire. She was christened the 19 March 1871. 15 January 1871 Job Barney the son of Alice Black and Vanlo Barney was christened at Inkpen, Berkshire. 22 January 1871 Morris Black the son of Henry Black and Rosa Cole was christened at Inkpen, Berkshire. 9 April 1871 Leander Black the daughter of Amos Jr. and Mary Roberts was christened at Inkpen, Berkshire. 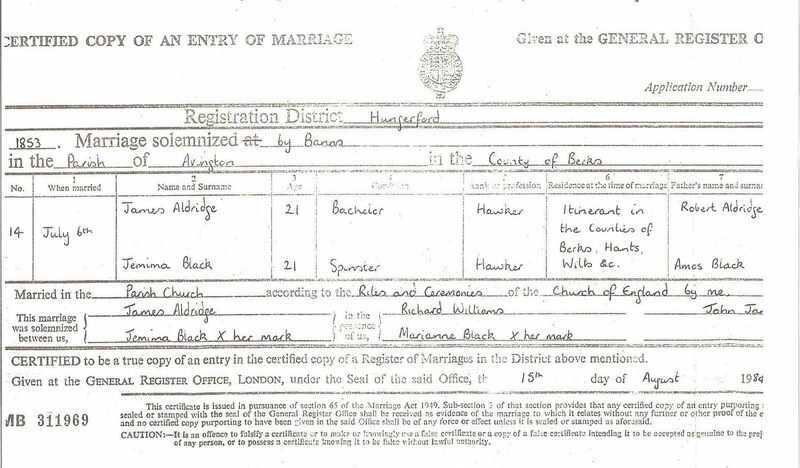 12 July 1871 Richard Walter Black the son of Walter Black and Eliza Hughes was christened in Inkpen, Berkshire. 1872 - 6 May 1872 Arabella (Isabella or Bella) Black married Henry Hamblin at Kintbury, Berkshire. 5 July 1872 Henry Edwin Spackman the son of Rosanna Black and Edwin Spackman was born at Kintbury, Berkshire. 24 November 1872 Mary Black the daughter of Henry Black and Rosa Cole was christened at Inkpen, Berkshire. 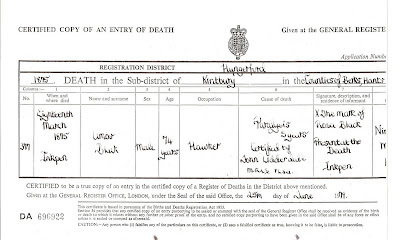 11 December 1872 Arthur Hamblin the son of Arabella Black and Henry Hamblin was christened at Kintbury, Berkshire. 1873 - 29 May 1873 Trainette Blackman the daughter of Amos Jr. and Mary Roberts was born at Inkpen, Berkshire. She was christened 21 September 1873 in Farnham, Surrey. 14 September 1873 Samuel Williams the son of Lemontania Black and James Williams was christened at Farnham, Surrey. 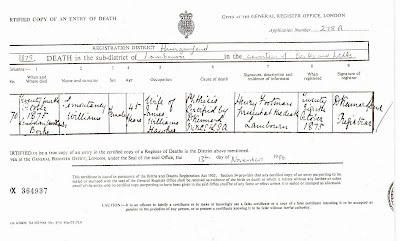 14 September 1873 Henr L. Blackman the son of Walter Black and Eliza Hughes and his sister, Traynette Blackman were christened at Farnham, Surrey. 17 October 1873 Freedom Black the daughter of John Black and Mary Doe ws born at Kintbury, Berkshire. 13 November 1873 Charlotte Black the daughter of Henry Black and Rosa Cole died at the age of 8 and was buried at Andover, Hampshire. 1874 - 10 January 1874 Frederick Black the son of Henry Black and Rosa Cole was christened at St. Mary’s Andover, Hampshire. 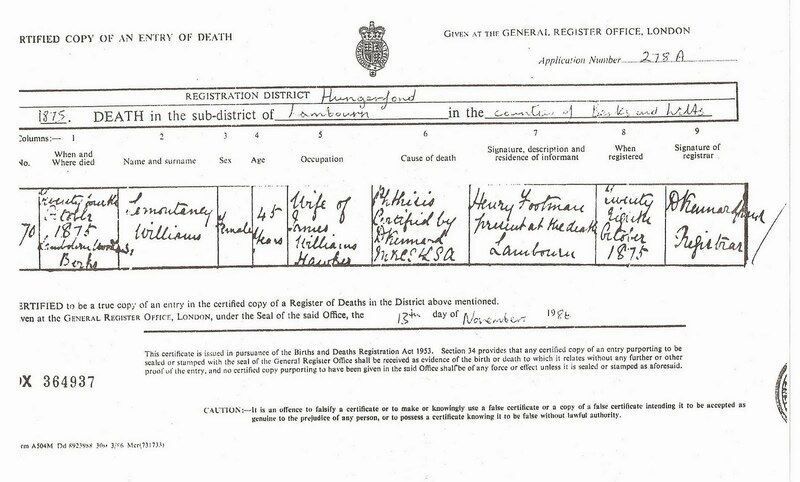 9 February 1874 Maurice Hamblin the son of Arabella Black and Henry Hamblin was born at Kintbury, Berkshire. Trisolime Black the daughter of John Black and Mary Doe was born at Inkpen, Berkshire. 26 August 1874 William George Spackman the son of Rosanna Black and Edwin Spackman was born at Newbury, Berkshire. 15 November 1874 Polly Barney the daughter of Alice Black and Vanlo Barney was christened at Goosehill Romsey, Hampshire. 1875 - 18 March 1875 Father and Grandfather Amos Black dies at Inkpen, Berkshire and is buried there. 9 June 1875 Mary Jane Hamblin the daughter of Arabella Black and Henry Hamblin was born at Kintbury, Berkshire. 26 September 1875 Sarah Blackman the daughter of Amos Jr. and Mary Roberts who was born at Inkpen, Berkshire was christened at Farnham, Surrey. 1876 - 22 February 1876 Nelson Black the son of John Black and Mary Doe was born at Coombe, Hampshire. 20 Aug 1876 Alice Spackman the daughter of Rosanna Black and Edwin Spackman was born at Newbury, Berkshire. 24 September 1876 Elias Goliath Black the son of Henry Black and Rosa Cole was born at New Street, Andover, Hampshire. 9 November 1876 Elia Goliath Black is christened at St. Mary’s Andover, Hampshire. 9 November 1876 Thomas Black the son of Henry Black and Rosa Cole is also christened at St. Mary’s Andover Hampshire. 29 December 1876 Leonard Black the son of Walter Black and Eliza Hughes was born at Pewsey, Burbage, Wiltshire. 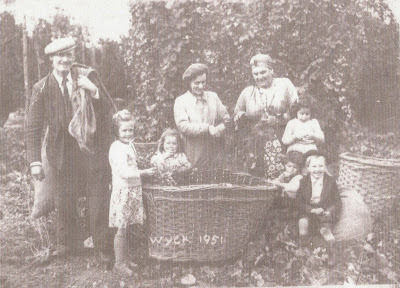 The first of the black family being born in Wiltshire. 1877 - Virtina (Virtue) Black the daughter of John Black and Mary Doe was born at Coombe, Hampshire. 15 April 1877 Alice Barney the daughter of Alice Black and Vanlo Barney was christened at Crawley, Hampshire. 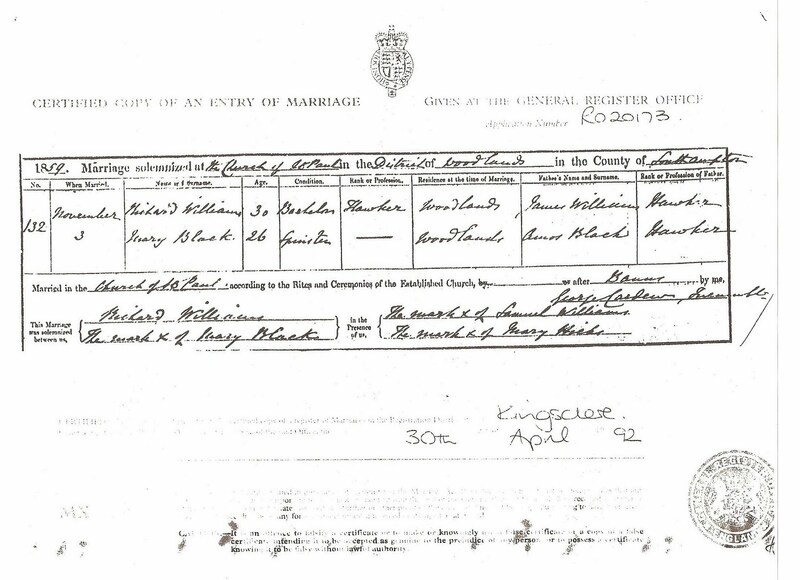 21 April 1877 Maurice Black married Annie Marie Holmes at Inkpen, Berkshire. 9 Nov 1877 Alice Ellen Black the daughter of Walter Black and Eliza Hughes was born at Moonlane, Hungerford, Berkshire. 23 November 1877 Alice Ellen Black was christened at Hungerford. 25 December 1877 Henry Black the son of Amos Black Jr. and Mary Roberts was christened at Inkpen, Berkshire. 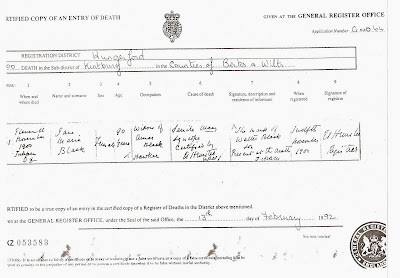 1878 - 11 January 1878 Rhoda Black the daughter of Maurice Black and Annie Holmes was born at Inkpen, Berkshire. 14 August 1878 Henry Matthew Hamblin the son of Arabella Black and Henry Hamblin was born at Kintbury. 24 August 1878 William George Spackman the son of Rosanna Black and Edwin Spackman died. 29 August 1878 Samuel Black the son of Henry Black and Rosa Cole was born at New Street Andover, Hampshire. 1879 - 16 April 1879 Francis Albert Spackman the son of Rosanna Black and Edwin Spackman was born at Newbury, Berkshire. 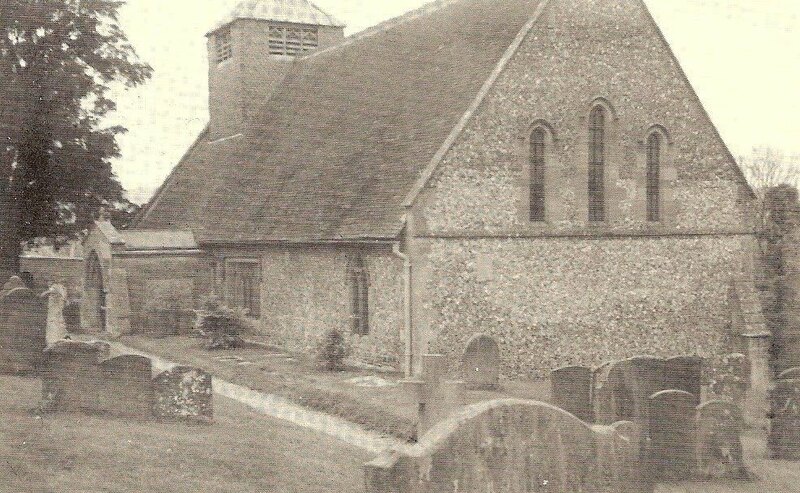 23 November 1879 Alice Black the daughter of John Black and Mary Doe was christened at Inkpen, Berkshire. 1880 - Rosanna Black and Edwin Spackman leave England for USA. 13 April 1880 Edward Black the son of Walter Black and Eliza Hughes was born at Great Bedwin, Wiltshire. 11 July 1880 Alfred Black the son of Henry Black and Rosa cole was born at New Street Andover, Hampshire. 29 September 1880 Harriet Barney the daughter of Alice Black and Vanlo Barney was christened at Chilworth, Hampshire. 1881 - 13 April 1881 Edward Hamblin the son of Arabella Black and Henry Hamblin was christened at Titcomb, Kintbury, Berkshire. 5 June 1881 Anne Selena Black the daughter of Amos Black Jr. and Mary Roberts was christened at Inkpen, Berkshire. 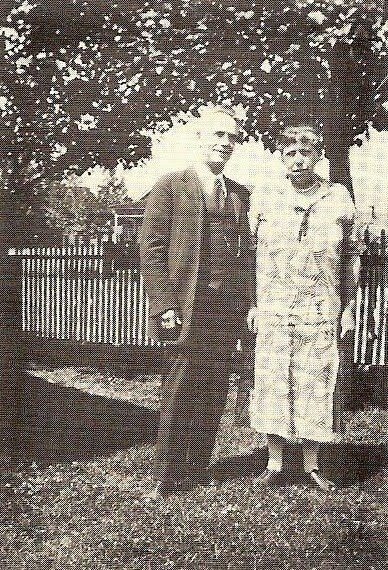 29 June 1881 Sarah Jane Spackman the daughter of Rosanna Black and Edwin Spackman was born at Richmond, Utah, USA. 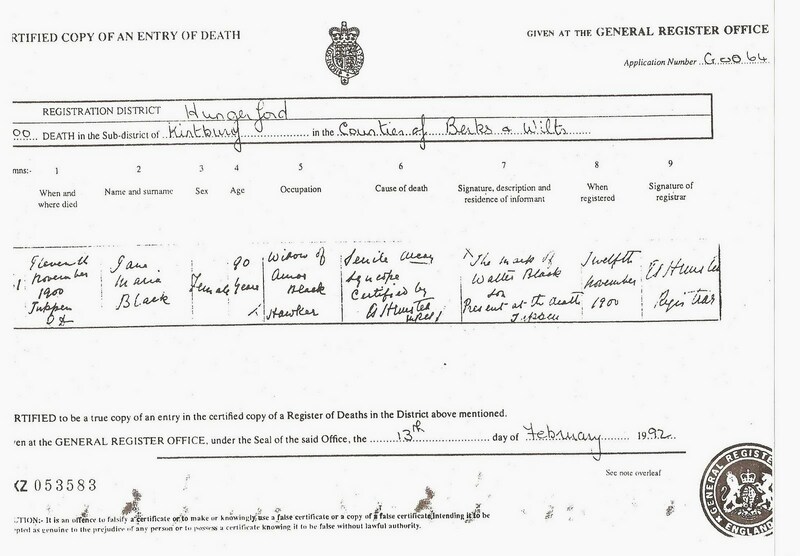 1882 - 21 May 1882 Mauria Black the daughter of John Black and Mary Doe was christened at Hungerford, Berkshire. She was born at Newbury, Berkshire. 13 September 1882 Rosa Black the daughter of Henry Black and Rosa Cole was born at 155 New Street Andover, Hampshire. 1883 - 8 December 1883 Reuben Hamblin the son of Arabella Black and Henry Hamblin was born at Kintbury, Berkshire. 16 Dec 1883 Alma Spackman the son of Rosanna Black and Edwin Spackman was born at Coveville, Utah USA. 1884 - 10 October 1884 Albert Hamblin the son of Arabella Black and Henry Hamblin was born at Kintbury Rd, Kintbury, Berkshire. 1886 - 11 April 1886 Ellen Spackman the daughter of Rosanna black and Edwin Spackman was born at Cove, Utah USA. 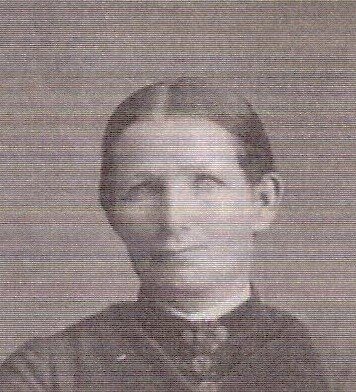 11 June 1886 Ellen Spackman dies at Coveville, Utah USA. 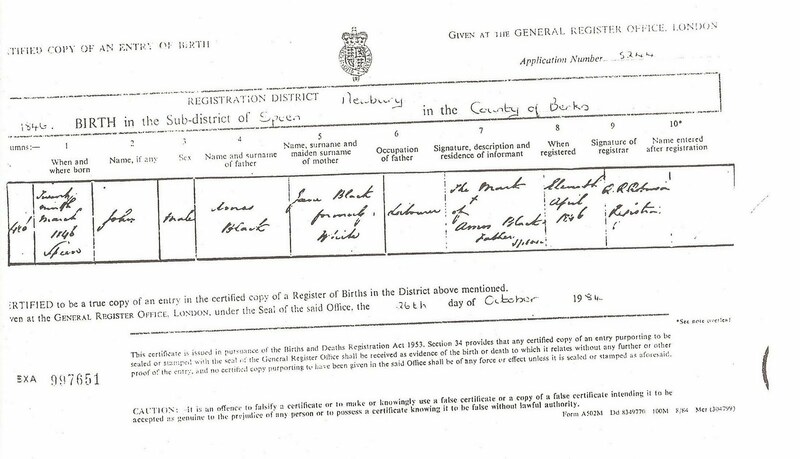 19 September 1886 Morris Black the son of Amos Black Jr and Mary Roberts is christened at Inkpen, Berkshire. 28 September 1886 Sarah Blackman the daughter of Amos Black Jr and Mary Roberts dies at the age of 11 and is buried at Inkpen, Berkshire. 1887 - 28 February 1887 William Hamblin the son of Arabella Black and Henry Hamblin was born at Kintbury, Berkshire. 6 May 1887 Brigham Spackman the son of Rosanna Black and Edwin Spackman was born at Cove, Utah USA. 1889 - 8 August 1889 Joseph Hyrum Spackman the son of Rosanna Black and Edwin Spackman was born at Provo, Utah USA. 1890 - Thomas J. Hamblin the son of Arabella Black and Henry Hamblin was born at Kintbury, Berkshire. 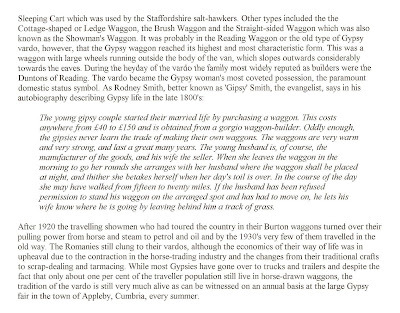 Not everyone described as a traveller or vagrant was a Gypsy. Not every hawker, basket maker, or chimney sweep was a Gypsy, but many were. By gathering a series of documentary references to an individual or a family, it may be possible to establish a Gypsy connection using a combination of typical occupations, forenames, surnames, and other data. 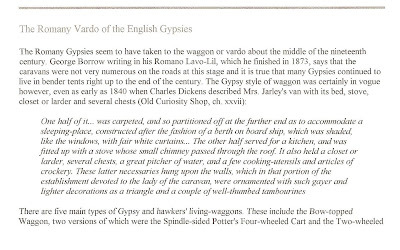 The following occupations were commonly practised by Gypsies, who provided goods and services to local communities in the course of their travels. The terms dealer and general dealer were frequently used by Gypsies from the late 19th century, but the terms were also used to describe other traders and shopkeepers. A marine store dealer was a dealer of scrap materials. 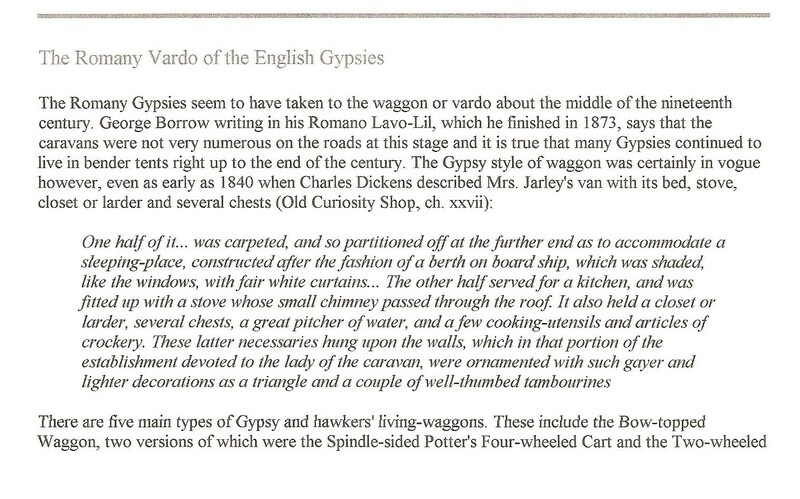 Gypsies often used standard forenames - such as Samuel, William, Mary - but they were also fond of unusual names. Ayers, Black, Blackman, Barney, Bowers, Buckley, Cole, Doe, Hall, Hibbard, Hughes, Loveridge, Rawlings, Roberts, Stokes, White, Williams, Bond. Lemonania or Clemantina as she was sometimes listed was christened 21 November 1831 in Boxford, Berkshire, England. She was the oldest in a large family of children. She was named after her paternal grandmother. She met and married James William Williams 23 July 1849 in Kintbury, Berkshire, England and to them were born 7 children (as far as we know). Susan christened 14 January 1868 in Hungerford, Berkshire; Jemima christened 18 September 1870 in Farnham, Surrey; Sampson christened 29 June 1856 in Newbury, Berkshire; Esther christened 24 December 1864 in Inkpen, Berkshire; Ralph William christened 10 January 1868 in Hungerford, Berkshire; Henry born 1870 at Wash Common, Newbury, Berkshire; and Samuel christened 14 September 1873 at Farnham, Surrey. She died 24 October 1875 at the age of 45 years at Lambourn Woodlands, Berkshire, England and was buried a day or two later there. Her husband died 8 April 1888 at Lambourn Woodlands and was buried there on the 13th. Mary Ann Black came next in the family and was christened 4 August 1833 in Combe, Hampshire, England. She met and married her husband, Richard Williams 3 November, 1859 at St. Pauls Church, Woodlands, Hampshire when she was 26 years old and he was 30 and a bachelor. She was a chairwoman by trade. She and Richard have 10 children listed that we could find: James christened 7 January 1853 Winterbourn, Berkshire, born at Newbury; Tom born 1854 Newbury; Amos christened 7 January 1856 at Inkpen; Richard Jr. christened 21 September 1873 Farnham, Surrey, born at Newbury; Sarah christened 30 September 1860 Farnham, Surrey, but born at Newbury; Mary born 1863 at Newbury; Samuel born 1864 at Newbury; Absalom christened 28 December 1866 at Hungerford, Berkshire; Jane christened 2 January1869 at Hungerford; and Job christened 4 September 1870 at Farnham, Surrey, but born at Ranton, Wiltshire. Mary Ann’s husband, Richard, died 14 April 1871 at Lambourne Woodlands, Berkshire at the age of 40. He died of bronchitus but other members of the family were suffering from whooping cough at this time and were all living at the same place. In the census of that same year he had been listed as a hawker by trade, but occupation was also listed as rat catcher, labourer, hawker on other records. In the 1881 census Mary was living in Newbury with her three remaining children. Mary Ann was 57 years old in the 1891 census and living with her sister, Jemima. Both women were widows. We haven’t found Mary Ann’s death date yet. William born 1861 at Newbury; Thomas abt 1863 at Newbury; Robert born 1865 at Newbury; Edwin 1866 Newbury; Charles Frederick 1867 at Newbury; and Flourence 1880 at Newbury. Jemima is said to have been the first one to own and live in a home. In the 1861 census the family was living at 96 Old Road in Newbury with 4 children and James’ brother William as a lodger. 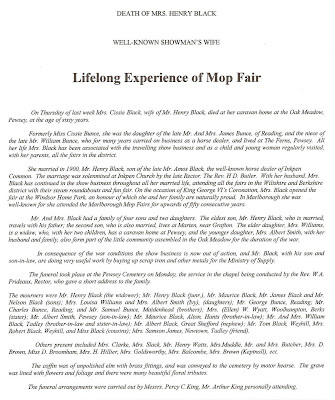 Amos and Mary Black (brother to Jemima) were living at 97 Old Road. 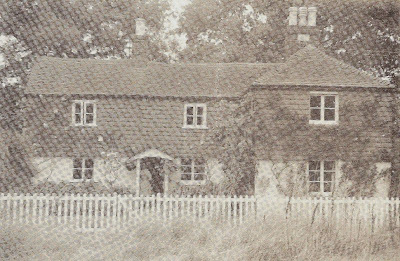 In 1871, census records say that Jemima and 7 children were living at 1 West Fields, Newbury. In the 1881 census she was living at West Fields with three sons, William, Robert and Edwin and with a one year old daughter, Flourence. 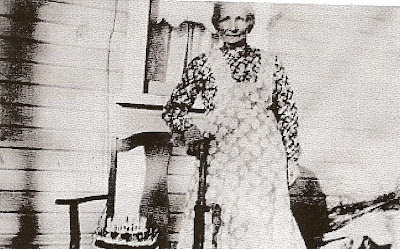 In 1891 she was living with her sister, Mary Ann and was 53 years old. She was a “dealer in left off wearing apparel”. We don’t have a death date on record so far. Alice Black, a most colorful figure, was christened 29 March 1838 in Hurstbourne, Tarrant, Hampshire, England. She married Vandelow Barney, a fellow gypsy, in 1862 at Medstead, Hampshire, England. Vandelow was christened at Medstead 5 February 1837. Together they also had ten children: Lavinia was christened 7 September 1859 at Binstead and is mentioned later in this document; Emma christened 3 March 1861 at Chilworth, Hampshire; Ameline christened 6 September 1863 at Holybourne, Hampshire; Brittania christened 17 September 1865 at Holybourne; Amos christened 22 September 1867 at Binstead, Hampshire; Athalia christened 9 May 1869 at Weeke, Hampshire; Joseph (Job) christened 15 January 1871 at Inkpen; Polly christened 15 November 1874 at Gooshill, Romsey, Hampshire; Alice christened 15 April 1877 at Crawley, Hampshire; and Harriet christened 29 September 1880 at Chilworth, Hampshire. 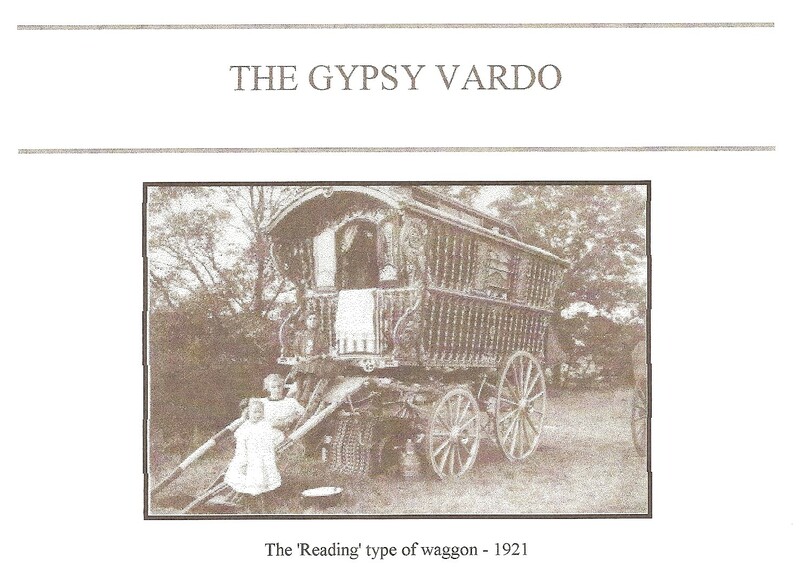 We don’t know much more about Alice and Vandelow except that they kept the gypsy traditions. Alice died and was buried 23 November 1911 at Botany Bay, Sholing, Hampshire. Vandelow had been buried in November 1893 at Otterbourne, Hampshire. 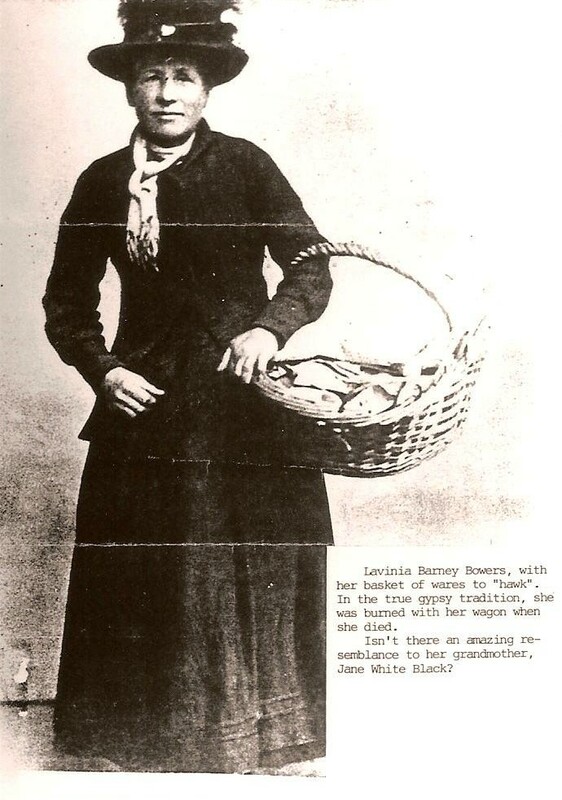 (Lavinia Barney Bowers below). A boy finally came into the family and was named Amos after his father. 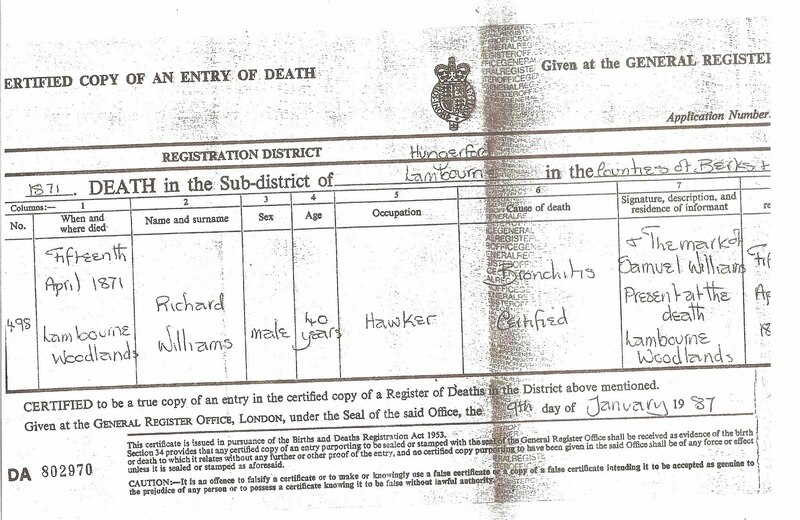 We have had a terrible time finding his birth information, but we think that he was born in 1839 at Thatcham, Berkshire. He is remembered by his peers as having a keen eye for horses and being a successful dealer in horses. It has been quite a journey trying to figure out Amos. We have come to understand that gypsy families often times lived together and had several children before they legally were married under English law. Amos Jr. and Mary (Polly) Roberts were married the 30th September 1875 at Farnham, Surrey, but children were born previous to this time. Henry or Brother Roberts was born in 1862 at Newbury and was always called ‘Brother’ by the others. He kept the last name of Roberts throughout his life. Alice was born 19 April 1861 at Old Newtown Road, Newbury and died when she was only 19 years old. Her gravestone can be seen in the Churchyard pictures; Amos was christened 30 September 1866 at Farnham, Surrey; Mary christened the same day 30 September 1866 at Farnham, Surrey; Nelson born 22 April 1869 at Inkpen and christened 14 September 1873 at Farnham; Leander born 1870 in Inkpen and christened 9 April 1871 in Inkpen; Trainette born 29 May 1873 in Inkpen and christened 21 September 1873 in Farnham, Surrey; Sarah christened 26 September 1873 in Farnham, born in Inkpen and died 28 September 1886; Henry christened 25 December 1877 in Inkpen; Anne Selena christened 5 June 1881 in Inkpen; and Morris christened 19 September 1886 in Inkpen. The picture of Trainette, Leander, and Morris is included on another page. Nelson listed above had a son, Henry Amos or Ben Black, who left England and emigrated to Milton Southsea, Portsmouth, Australia and died there in 1992. His descendant, Vanessa Black, corresponds with us from Australia. In 1881 census the family was living at ‘Great Common’ at Inkpen. Walter was born 21 June 1842 in Kintbury, Berkshire. He and his wife, Eliza Hughes, were married 1 October 1877 at Bentley, Hampshire and to them were born 8 children that we have found. John George born at Basingstoke, Hampshire and christened 22 November 1863 in Inkpen; Joan born 1864; Charlotte born at Choulston, Wiltshire and christened 23 September 1866 at Farnham; Richard Walter born Bentley Green, Hampshire and christened 12 July 1871 at Inkpen; Henry L. born at Moriston and christened 14 September 1873 at Farnham; Trainette born 3 July 1873 at Durrington and christened 14 September 1873 at Farnham; Leonard born 29 Dec 1876 at Burbage; Alice Ellen born 9 November 1877 at Moonlane, Berkshire and christened 23 November 1877 at Hungerford, Berkshire; and Edward christened 13 April 1880 at Great Bedwin, Wiltshire. In the 1881 census the family of eight children and mother and father were living at Durrington, Wiltshire and listed as ‘travelling Hawkers’. Walter died the 16 May 1918 in Inkpen where he had lived with his family and was buried there in the Inkpen churchyard the 20 May. I found his gravestone there in 1978 as well as his wife’s in the back of the church. The footstone was engraved as being donated by their sons, Henry L. and E. Black (Edwin). I wrote down the inscriptions from all of the gravestones in a little notebook, but have misplaced it. When I find it I will insert the inscription here. On the 24 April 1844 Henry was born at Kintbury, Berkshire where the family was staying. 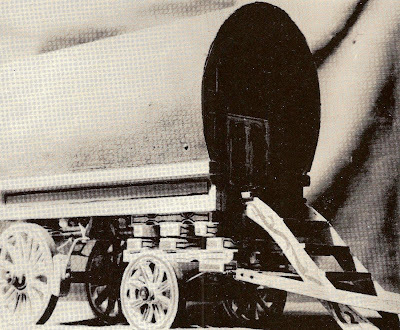 He was christened 1 May 1844 at Hungerford, Berkshire. 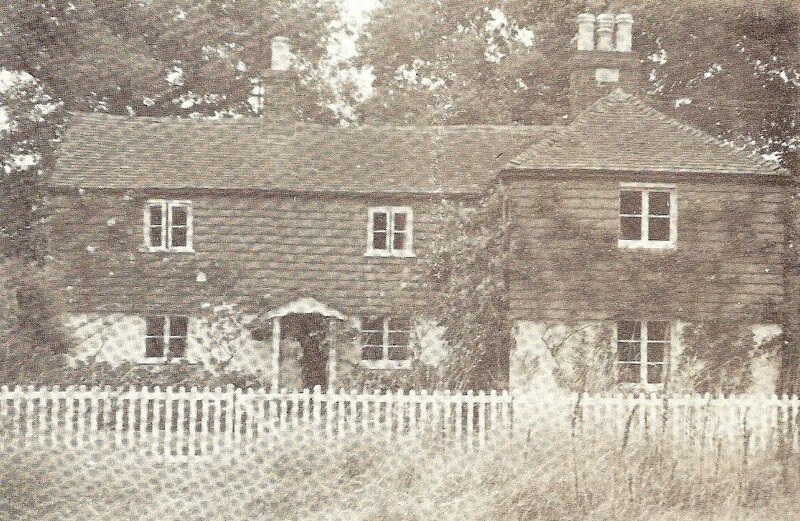 On the 22 September 1874 he married Rosa Cole at Farnham, Surrey, a popular place for the family to meet together and perform family by the government. 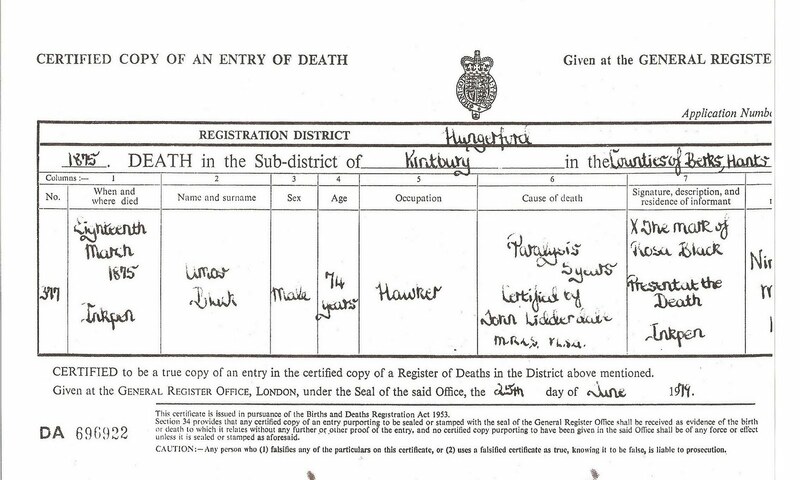 To them we have found 10 children born to them: Charlotte christened 22 October 1865 in Inkpen; Henry (Harry) christened 23 June 1867 at Inkpen (we think that this might be the Henry who emigrated to Canada); Thomas born 1869 and christened 9 November 1876 at Andover, Hampshire; Morris (Maurice) christened 22 January 1871 in Inkpen; Mary christened 24 November 1872 in Inkpen (Mary married Stephen Bull in 1899 - a picture of her family will follow this page. Stephen’s family had lived in New Street in Winchester since 1847. She lived in Colebrook Street, Winchester where she died. They had eight children, of which there were two sets of non-identical twins, and Stephen’s occupation alternated between Dealer, Chimney Sweep, and Horse Dealer found on christenings of their children in the St. Maurice’s Parish Register. She died in 1938 age 64 and was buried in the Magdelan Hill Cemetery, Winchester. In her Will she left everything in trust to her children... her house, Builder’s Yard and ‘premises being No 3 King Alfred Place. Stephen Bull died in 1951); Frederick was born next and christened 10 January 1874 St. Mary’s Andover, Hampshire; Elias Goliath christened 9 November 1876 St. Mary’s Andover and who died age 22 in 1899; Samuel (Sam) born 29 August 1878 at Andover and christened 9 December 1878 at Andover; Alfred born 11 July 1880 Andover and christened 20 March 1881 in Andover; and Rosa born 13 December 1881 at Andover. Henry died 28 September 1903 at Andover and was buried there a few days later. Daughter of Henry Black, Mary Black Bull with her husband, Stephen and her children. She looks a lot like her grandmother Jane White Black. This picture was sent via e-mail from our cousins in England. In the 1881 census Henry Black and his wife Rosa were living with their seven children at 155 New Street Andover, Hampshire. John Black was born 29 March 1846 at Speen (Stock Cross), Berkshire, England. 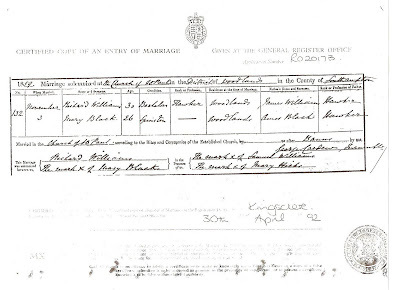 He and Mary Ann Doe of Rotherwick, Berkshire were married 17 November 1864 at Inkpen. To them were born 10 children: Amos christened 1 Apr 1888 at Wootton Rivers, Wiltshire; Caroline christened 8 November 1866 in Newbury; Bella born 1870 at Horsham, Surrey; Maria born 11 January 1871 at Inkpen and christened 19 March 1871 there; Freedom born 17 October 1873 at Kintbury and christened 2 November 1873 at the same place; Trisolime born 1874 at Inkpen; Nelson born 22 February 1876 at Coombe, Hampshire and died the same year; Virtina (Virtue) born 1877 at Coombe also; Alice christened 23 November 1879 at Inkpen but born at Bentley Green, Hampshire; and Mauria (Mauriah)(I think that this is actually a son, Maurice)christened 21 May 1882 at Hungerford, Berkshire but born at Newtown, Hungerford. The 1881 census has the family living at Newtown, Hungerford, Berkshire; mother, father and six children. A descendant of this John Black, by the name of Jack Black has been in touch with me and sent me the following information. “A REMARKABLE WOMAN - THE LATE ‘GRANNY’ BLACK, OF EASTON ROYAL. By the death of Mrs. Mary Black, widow of Mr. John Black, of Bonfire Lane, Eston Royal, the district lost one of its best-known personalities. Eighty-six years of age, Mrs. Black was well-known throughout the neighborhood as a hawker of small wares, and she was a highly-respected woman. Up to about two years ago Mrs. Black was a marvel of activity, walking many miles a day. She usually travelled on foot in company with her husband, with whom she lived at Bonfire Lane for over 50 years. Mrs. Black was brought up in the neighbourhood of Burbage, and was married at the early age of 16 at Inkpen Church. On leaving that village the couple lived for a time at Newbury. There was a family of eight daughters and . One of the daughters has (11-17 can’t read) children and Mrs. Blacks grand-children, great-grandchildren, and great-great-grandchildren have become so numerous that the venerable lady had ‘lost count’ of them. Mrs. Black was described to our representative as ‘a good old soul’, the informant adding that ‘she and old John were both as honest as the day’. One well-known fixture of by-gone days was ‘The Gammon Revel’ (held at the Bruce Arms Inn, Easton Royal) at which one of the chief features was a back-swording contest. Up to a few years ago this fixture was so important that the Pewsey Schools were always closed on Trinity Tuesday to allow the children to attend what afterwards became known as the Milton Club festival. On these occasions ‘Granny’ Black, often enjoying a quiet pipe, was always in evidence. During her widowhood Mrs. Black has lived with her daughter and son-in-law, Mr. and Mrs. C. Becknell. The funeral was on Thursday, in the Churchyard of Easton Royal, where a wonderful tomb– an arm chair in beadwork under a wooden canopy– marks the grave of her husband. The Rev. E.H. Blyth officiated, and played the two hymns which were sung by a large congregation. Rosanna comes next in the family order but I am going to insert here the other brothers and sisters and then go to Rosanna and her descendants after them. Arabella or Bella Black was born in 1852 in Mortimer (Inkpen), Berkshire, England. She was close to Rosanna in relationship as a sister, and they raised their children together later when they lived close together as neighbors. She married Henry Hamblin 6 May 1872 at Kintbury where they were to raise their children. To them were born the following children: Arthur christened 11 December 1872; Maurice 9 Feb 1874; Mary Jane 9 Jun 1875; Henry Matthew 14 Aug 1878; Edward Charles 13 Apr 1881; Reuben Francis 8 Dec 1883; Albert Augustine 1884; William 28 Feb 1887; and Thomas John July1889. Rosanna’s daughter, Charlotte, writes a little about her Aunt and Uncle and boys, but she doesn’t mention any of the children but the older boys. I’m not sure why. In the 1881 census the family is living at Titcombe, Kintbury, Berkshire. Edward is not mentioned, so he must have died as a baby. We also have not found their death dates, but have read in some letters that Bella was living in Reading, Berkshire later in life. Maurice, the youngest of the fourteen children, was christened the 2 June 1858 at Inkpen. He and his wife, Annie, whom he had married 21 April 1877 in Inkpen, remained the only ones who kept in contact with Rosanna in American. Annie could read and write and would correspond with her, while Rosanna could do neither and had to rely on others to read her mail and write her responses. Maurice and Annie only had one child, Rhoda, who was born 11 January 1878 at Inkpen and christened 10 February of the same year. 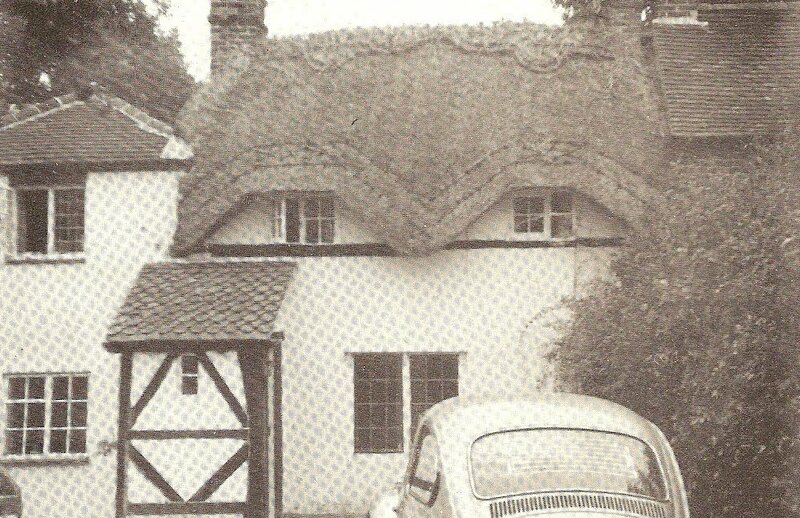 Maurice and Annie lived at Rose Cottage in Inkpen just down the street from Black Latches and other members of the family all their married lives. They were the ones who took care of Jane in her old age. Maurice died 2 May 1940 and Annie followed him in February 1950. They are buried in Inkpen. Rosanna Black was born 19 January 1848 in Inkpen, Berkshire, England. She was born into a large family — there were 14 children when the family was complete. She was number nine, there were 7 girls and 7 boys. Two boys, both younger than Rosanna, died when young. Thomas, age 7, died 21 March 1857; and Matthew, age 8, died 6 March 1858. A girl, Rhoda, also died young but we have been unable to find her death date. We only know that she died before the 1861 census. The Blacks were a traveling family; in fact, on census records and christening entries they are listed as “travellors” and in some cases, “tramps” depending on the opinion of the recorder. 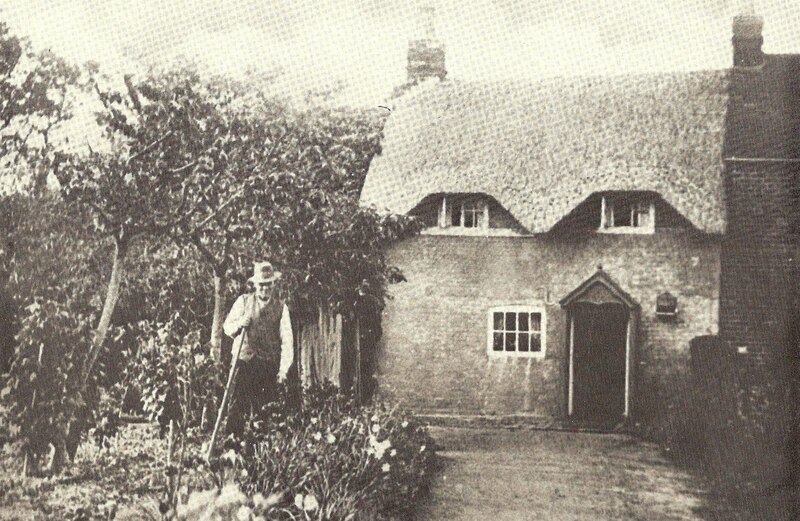 They owned at least two cottages in Inkpen at one point and were well thought of. They were from “the people known as Gypsies” and were horse traders and hawkers selling their wares wherever they went. We have record of their families traveling as far south as Beaulieu, Hampshire; as far east as Farnham, Surrey; as far west as Pewsey, Wiltshire; and as far north as Chievely, Berkshire. We have found in the christening dates of Rosanna’s brothers and sisters’ families that the children were blessed in groups, some being several years old, and most of the time in the month of September. From this we can assume that the family traveled together or met at a chosen place every few years to take care of these ordinances in the Church of England. Rosanna never learned to read or write because she never had the opportunity of going to school, but I would bet that she learned a good deal about life and people when traveling around the country. There was quite an age difference between Rosanna and her older sisters. Clementina, christened 21 November 1831, was married when Rosanna was one year old. Jemima, born about 1832, was married 6 July 1853, when Rosanna was five. Mary, christened 4 August 1833, at present no marriage date has been found. Next in line came Alice about 1837, Amos about 1839, Walter 21 June 1842, Henry 24 April 1844, John 24 April 1846, then Rosanna 19 January 1848, Thomas 19 January 1850, Matthew christened 28 March 1852, Arabella about 1853/54, Rhoda christened 24 December 1856, and Maurice christened 27 June 1858. 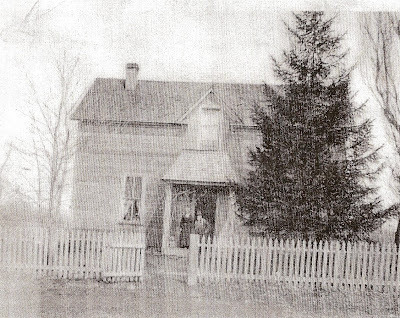 When Rosanna’s father, Amos, became ill in 1863, Jane cared for the family and earned a living by going from house to house and place to place selling her wares. She had a large apron that she had sewn pockets on and she would fill these pockets with things to sell. From her obituary we are led to believe that she even read people’s palms and they in turn bought what she had to offer. Rosanna, Arabella, and Maurice were at home, the girls staying until they married. 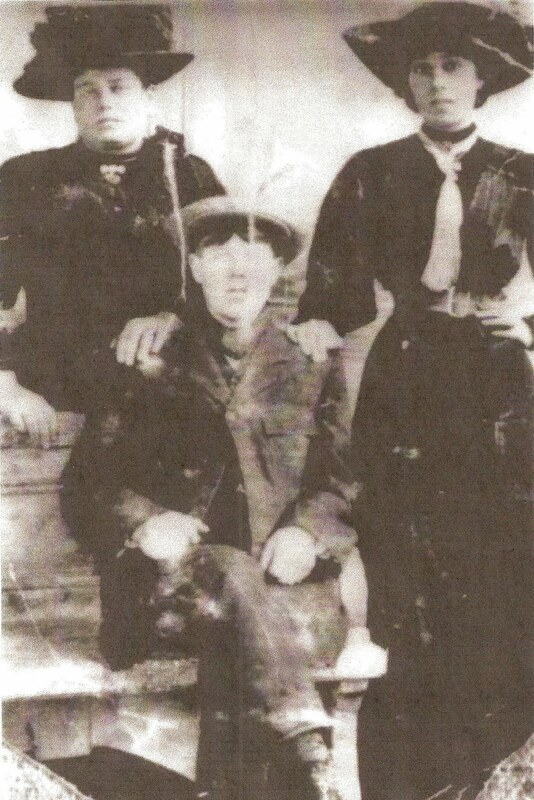 Maurice didn’t get married until a couple of years after Amos’ death and then Jane lived with him and his wife until she died in 1900 at the age of 90 years. Rosanna could have been living with her brother, Henry, and his wife during part of this time also. That could explain Henry signing her marriage certificate as a witness instead of Amos, her father. 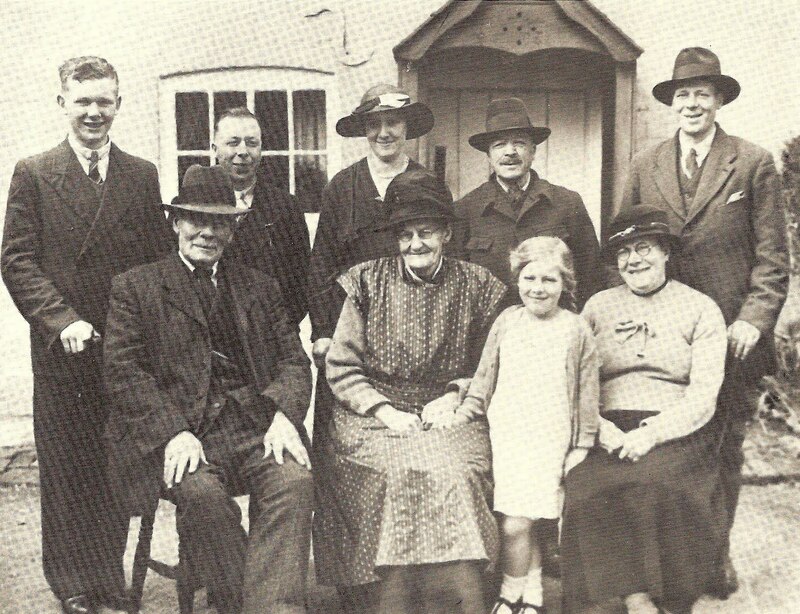 About 1865 some of the Black family found themselves in Burbage, Wiltshire. Rosanna’s brother, Henry, was doing some business with a man called Henry Spackman. Henry Spackman had a son whose name was Edwin; and he and Rosanna fell in love. 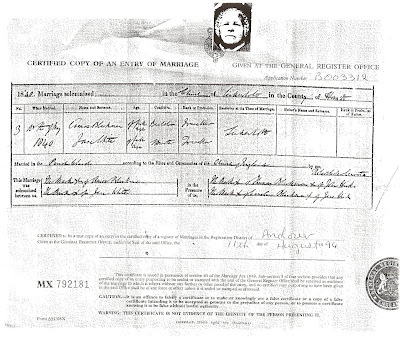 On the first Monday in August (8th) 1865 (the marriage certificate says 24 July 1865) they were married after Banns had been published, in a parish in Burbage. The marriage certificate is witnessed by Henry Black, a brother of the bride; and Sarah Ann Spackman, a sister of the groom. Rosanna was only 17. Edwin Spackman was born 28 June 1846 at Burbage, Wiltshire, England. He was the oldest child of nine born to Henry Edwin Spackman and Ann Bond Hibbard. One child, a twin boy named William, died soon after birth. The other children were born in Burbage so the family must have stayed pretty much around the area even though the occupation of Henry was “Hawker”. The rest of the children were: Mary Jane, 1848; Henry 1850; Elijah 1852; Brigham, 1854; twins Naomi Emma & William 1856; Sarah Marie 1859; and Annie 1861. Edwin loved trading, selling, and owning horses. Before leaving England he was a caretaker of some stables with beautiful horses owned by a rich man. They were converted to the gospel and baptized 16 November 1877 and were members of the Reading Conference. I hope the knowledge of the gospel helped them when about a year later their little boy, William George, died just a couple of days before his 4th birthday. Then the decision was made to “come to Zion” and gather with the Saints in the tops of the mountains. They prepared for the journey and saying farewell to their loved ones for this lifetime, set sail 5 June 1880 from Liverpool on the ship “Wisconsin”. A family with six children on a boat for three to six weeks would not be an easy task. I must say here that the parting was not sweet. Granny Black was not happy with the family leaving. Their families had been very close — living close to one another, traveling together, being in business with each other, etc. I don’t know if any other members of the family were at the dock in Liverpool to say goodbye, but I do know that Granny was there and there was much sadness and anger on her part. She kissed the grandchildren goodbye but when it came time to say goodbye to her daughter, Rosanna, she simply spat in her face. My heart goes out to both of them for their loss. They traveled by rail to Salt Lake City, and by 29 June 1881 were in Richmond for the birth of their daughter, Sarah Jane. Next came Alma 1883, Ellen 1886 (who died when two months old), Brigham 1887 (all born in Cove, Utah), and Joseph Hyrum 1889 (born in Provo). Iris Spackman, Hyrum’s wife, remembered Rosanna as being a very quiet person, especially when Edwin was around. She didn’t talk very much, but kept her English accent all her life. Uncle Ted Spackman, Hyrum’s oldest son, remembered his grandmother calling him “Teddy” and the sweet person that she was. Funeral services were held Tuesday at 2 p.m. at the Richmond tabernacle for Edwin Spackman who died at his home Saturday from infirmities due to old age. The services were conducted by Counselor Noah Woodland. The choir sang, “O My Father”. Prayer was offered by William Bowman of Lewiston. The choir sang, “God Moves in a Mysterious Way”. The speakers were S.C. Nelson, August S. Schow, Bishop J.L. McCarry, George O. Webb, and Hazen Spackman. They all spoke of Brother Spackman having joined the Church in his native land and coming here for the gospel’s sake. He was a good friend of the Elders in England. 59 grandchildren and 47 great-grandchildren. Mrs. Sarah M. Yeates and Mrs. Annie Humphreys, of Logan survive. Rosanna moved to Preston and lived in a house at 165 W. 4 South near some of her family. Still later she stayed for a while with Hy and Iris Spackman in Preston and then with Alma and Clara Spackman in Richmond. She died in Preston at the home of Hy and Iris of old age September 18, 1935, and was buried in the Richmond cemetery next to Edwin. (There is a discrepancy on the death date, the death certificate states that she died on the 18th, but the newspaper obituary states that she died on the 19th). greater part of her life there. was also a duet by Ezra Corbridge and Mrs. Vesta Lewis. Prayers were offered by Walter Rawlings and Martin Shaffer. That visiting teacher of mine. And distinguishing wrong from right. To a glorious crowning success. Gave the greatest service of all. No doubt you will be wondering who I am, so let me first tell you. number of Americans littered around Inkpen, Kintbury, etc. for a fortnight and grandfather fretted at being parted from grandmother. the accident but the Lord was good and spared her to us in April. and he collapsed trying to get out of bed and died in grandmother’s arms. a daughter 15 ½ years. had him apprenticed for 4 years. names, well, we are only a small family. There is grandmother (Mrs. Maurice Black). Alfred Goddard. There were only my brother Alfred and I (Maurice) by my mother’s marriage. Born 27 September 1866 in Coldrey, Hampshire, England, Amos was the first child of Edwin and Rosanna Spackman. When he was growing up he traveled the countryside in England with his mother and father. In 1871 when the census was taken, he was 4 years old and was staying with his grandparents, Henry and Ann Spackman at #11 High Street in Burbage, Wiltshire. It could have been because his mother had just had her 3rd child or was just a visit to their home. For whatever reason, he was there at their home. Amos was baptized in England 20 March 1878 when 12 years of age. He was 14 in 1880 when the family emigrated to Utah. We can only assume that Amos worked and struggled along with other family members during the next 8 years, but during this time he met Josephine Halverson and on 2 February 1888 was married in the Logan Temple. 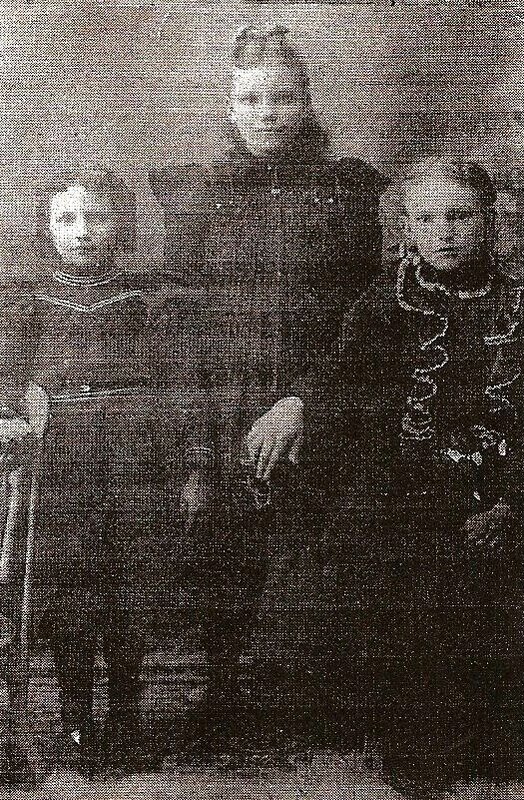 They had three children, Ethel, Florence, and a boy, Halverson (Halley). When Halley was three years old, Josephine died. She is buried in Richmond cemetery. Amos then married Francis Wilson from Logan. The 3 children from the previous marriage were raised by other people. Halverson was later killed at 7 years of age when he fell under a harrows. He was living with a Beckstead family in the Preston, Idaho area. Amos and Francis stayed in the Logan area until after their 6th child was born. Then they moved to Butte, Montana where Amos worked as a timekeeper at the Mountain View mine and then a watchman at the Lexington mine. He was quite a handy man and could fix anything. Amos and Francis had 12 children in all: Con, Arthur, Wilson, Vanetta, Florence May 30 May 1902, Vernon 1 Feb 1904, Maurice 1 Mar 1906, Violet 13 December 1908, Ruby, Lee Roy 2 September 1911, Howard Delmos (died age 24 of tuberculosis), and George Clyde. Amos was a hard worker and Frances was a good mother to her children. There were often hard times but there was always a home to live in and food on the table for the family. Francis had poor health in her later life and passed away after suffering from a stroke. Amos married a Mrs. Odgers. She passed away about a year later. He then married Ada Hodges but died not very long afterwards on the 22 December 1946. He is buried in the Mountain View Cemetery in Butte. Life was not easy in these early communities and many people suffered in bearing their children and raising their families. Amos was remembered by our family here in Preston as a fun-loving person who seemed kind and caring. When interviewing Amos’ children they were still carrying feelings of anger against their father. We cannot judge people’s motives or decisions made in their lives or begin to analyze their behaviors and actions, all we can do is determine how we will shape and mold our own lives, how we will meet our challenges. Hopefully at our demise we will be remembered for good that we have done and not with ill feelings by our descendants. Annie was born 8 November 1868 in West Woodhay, Wiltshire, England, to Edwin and Rosanna Black Spackman. She attended a church school in England where she received an award for being an honor student. She had a beautiful singing voice and sang in the church choir. After emigrating and coming to the Lewiston area at the age of 12, Ann attended the public school here. She was a very attractive person with a loving personality. She was very industrious and was always willing to help her neighbors in time of need. She became self-supporting at an early age. She married Andrew Lee Allen as his second wife one month short of her 16th birthday, 8 May 1884 in the Logan Temple. She was a good helpmate and a very good mother. Andrew L. Allen was born in Burton, Cattaraugus County, New York, 16 August 1832. He joined the church in New York and worked with his family to earn money to come West. He operated a saw mill in Richmond, served in the Blackhawk War, and stood guard against the Indians. 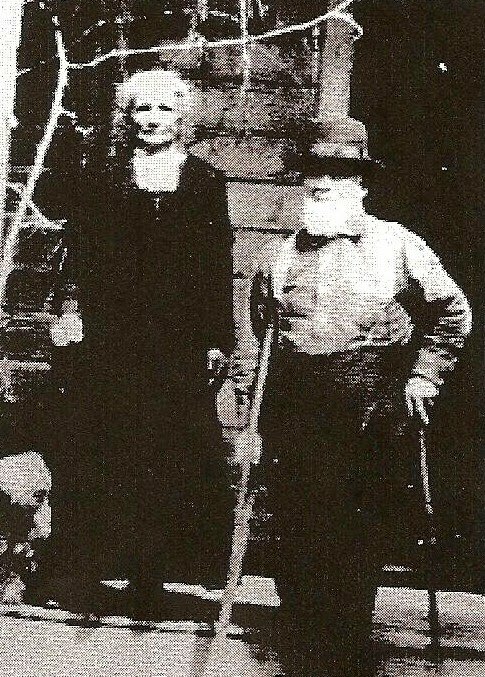 He married Minerva Whittle 4 March 1872 in Salt Lake City, and by 1873 they were farming 160 acres and had a home in Coveville. He later was called as Bishop to the Coveville Ward and served for 25 years. After Andrew married Ann he left Minerva and children in Richmond to run their land there, and took Ann to Cardston, Alberta, Canada with the original pioneer company that left northern Utah the latter part of March 1887. They were at a place called Lees Creek bottom. They returned to Utah later that same year. They were the parents of four daughters, Ann Clarinda was born in Cove the 14 March 1886. As the pressure against polygamists increased, Andrew felt it necessary for Ann to leave the valley. 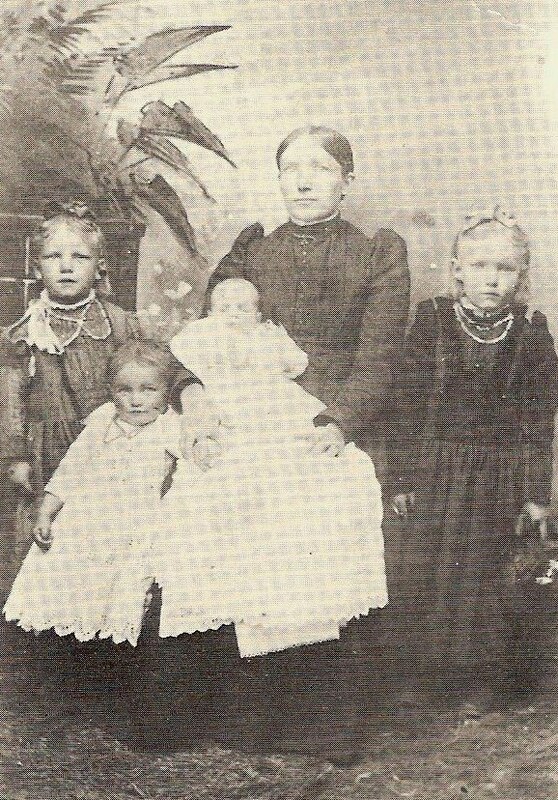 So in 1887 her father and mother, Edwin and Rosanna, were hired to leave their home in order to take Ann, her little daughter, and an unborn child to Southern Utah. It was in St. George that Rose (Rosanna) was born 30 Aug. 1888. In 1890, the year the Manifesto was signed abolishing polygamy, Ann returned to Lewiston and then went to Afton, Wyoming where Constance Julia was born 30 August 1890, and Ethel Ellen was born 20 July 1892. Ethel died of pneumonia 23 October 1892. Ann was living in Ogden when she passed away 2 June 1900 at the young age of 32. She is buried in Richmond, Utah. 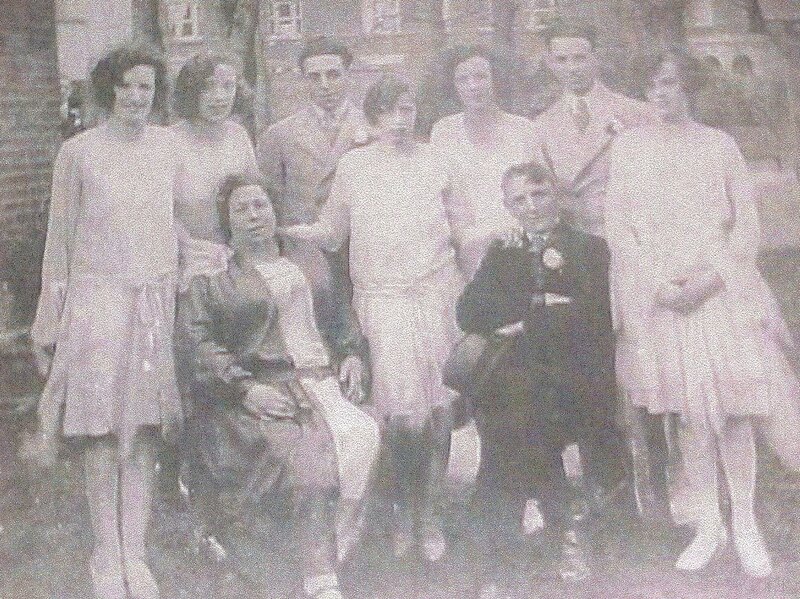 Anne’s three surviving daughters are pictured upper right.